Taken from the Lancome website: “Want glowing skin in 7 days? Here’s your answer in a bottle. This innovative serum soaks into skin, targeting the 10 key signs of youth: texture, resiliency, elasticity, firmness, sagginess, fine lines, wrinkles, radiance, even skin tone, and clarity, with noticeable results in just 7 days. Advanced Génifique is the perfect first step after cleansing to reveal smoother, more radiant skin for all ages, ethnicities, and skin types. 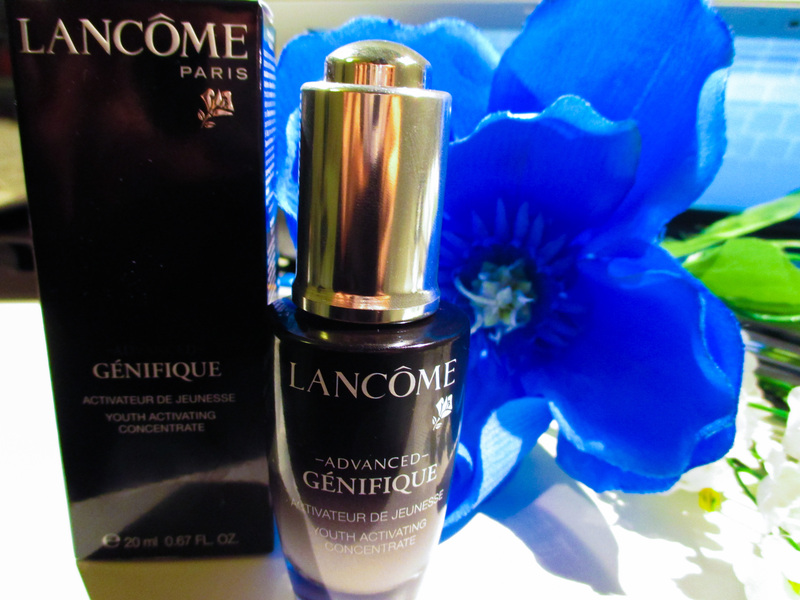 With an exclusive self-loading dropper, Génifique delivers the ideal dosage to bring back the light into your skin”. I bought a 20ml bottle of this serum from Feel Unique for £29.00. I’ve been using this serum daily morning and night for two weeks now and I feel as though I have used the product long enough to give you my informed opinion on it. Packaging : I like the packaging of this product, the glass bottle feels very luxurious and looks great on my vanity. The bottle comes with a dropper that dispenses just the right amount of serum for your face and neck. Because the bottle is made of glass it may make travelling with it difficult. Formulation: This serum has a couple of good ingredients in it like Sodium Hyaluronate (Hyaluronic Acid- skin moisturiser), Adenosine (helps defend skin against free radical damage by aiding antioxidants) and Ascorbyl Glucoside (Vitamin C). There are some bad ingredients in this product too. There is alcohol in this serum which for me is a major no-no in skin care. Citronellol (fragrance) and Parfum. These three ingredients have the potential to damage and irritate your skin if used over a long term period. Texture and appearance: The appearance of this serum is an almost clear liquid. The texture starts of like a normal serum but once you rub it between your palm it melts into a watery consistency. This means that it absorbs very quickly into the skin and feels very light with no sticky feeling afterwards. It has a very smooth finish which I suspect is due to the presence of Dimethicone in the formula. Smell: I can’t quite place my finger on the fragrance, it just has that “serum smell”. 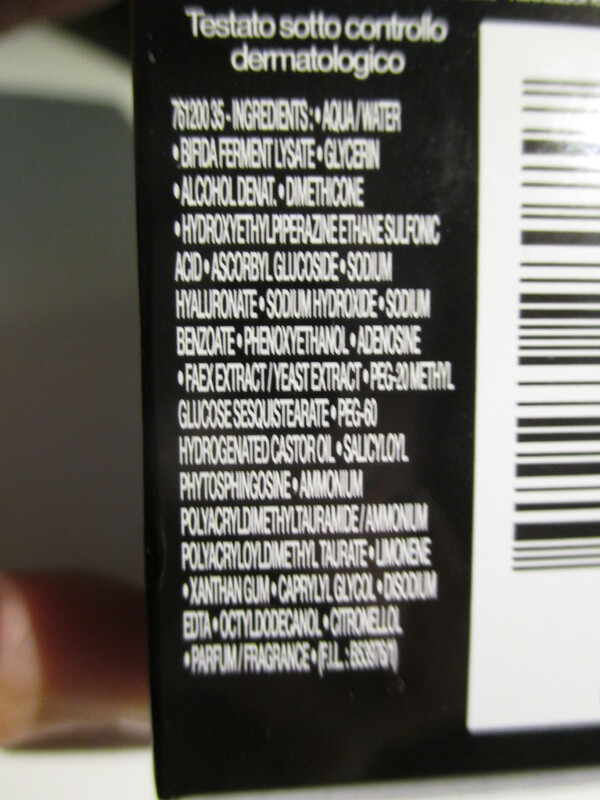 Either way there is added Parfum/Fragrance in this product making it unsuitable for sensitive skin. Not sure why Lancome added fragrance in this product as it serves no purpose! Results: The first time I used this product I woke up with brighter skin overnight. However this brightening effect stopped after the first few days and it went back to looking dull. Unfortunately as this has such a light texture I didn’t feel it was hydrating enough. Furthermore it caused a small breakout on my left cheek and chin, I suspect this is due to the perfume or alcohol in the formula. I didn’t notice any plumping of the skin or improvement in fine lines. Overall verdict: This serum gets a thumbs down from me I’m afraid. I’m trying to cut down on fragranced products as they can cause long term damage to the skin. Also the alcohol in the formula puts me off using it again. Whilst this did cause an immediate overall brightening effect there were no longer term effects that outweight the potential damage the bad ingredients could cause. I would say that the Estee Lauder Advanced Night Repair trumps this serum by far. Yeah I wouldn’t bother with this one, I’d recommend the Estee Lauder Advanced Night Repair if you’re looking to invest in a serum.